last update, April 24, 2019. 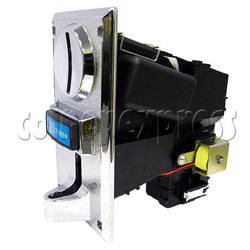 A front type multi-function CPU coin acceptor can accept 1 kind coin or token but only output 1 signal to read the value what coin or token is inserted. It is an intelligent device by using the CPU to distinguish the counterfeit. It is not only good for your Amusement Machine but also Vending Machines. Can at any time adjust to throw the accurate degree of the currency machine,in keeping with different amenity demand . Identify true or conterfeit according to the coins material and diameter,high accuracy. Step 3: Connecting the +12V DC and Ground wiring for the coin Acceptor. Step 5: Press the "Set" button thress seconds, the LED light will glimmering Slowly and then press again the "Set" button, the LED light will glimmering much faster. Step 6: Insert 20pcs coins in turn to set the coin (time interval 0.3 seconds) after the Led light keep lighting then it's mean finished the setting.